Along with director Steven Lisberger, producer Donald Kushner was responsible for developing 1982’s groundbreaking electronic adventure TRON. He also acts as executive producer of eyepopping new sequel, TRON Legacy. “The original TRON forecast the future,” he tells Matt McAllister. 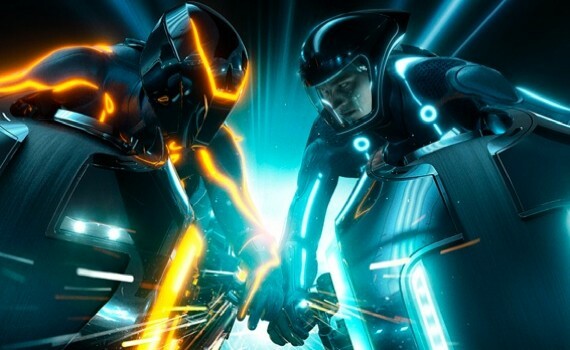 Can you briefly tell us how you were involved in getting the original TRON off the ground? I was the sole producer on TRON, and developed the script with Steven Lisberger and Bonnie MacBird. We went out and figured out how to do the computer animation, and we also did some of the original production designs. And then I was the one who set it up at Walt Disney. What elements do you think the sequel retains from the original? The structure of the film is the same – you have the characters in the real world being represented in the electronic world. Remarkably I think the electronic look is also very similar, and some of the main features in both films are the same – the Light Discs that they throw at each other and the Light Cycles and the Recognisers. Those are elements I think were great in both. But [the effects team] have a lot more tools to work with today than they did back then, so the electronic world can be rendered a lot more realistically. How important was it to get Jeff Bridges and Bruce Boxleitner back on board, and were they interested in coming back right from the start? I think they were both interested from the beginning, and they were really important to create a continuity and the legacy. Jeff Bridges won the Academy Award last year, of course, so that didn’t hurt. Playing both the hero and the villain is a good role for any actor – plus I think any actor would be interested in playing someone 30 years younger! Do you think that reality has caught up with ideas in the original film? The idea of having a small personal computer was a dream back then. Now it’s part of everyone’s life. So I think that one of the strengths of the original TRON was that it forecast the future. I also think that the first film’s idea about having a different social identity in the virtual world really forecast Facebook and the internet. So I think it retained a fanbase who understood that, while it was a sci-fi movie, a lot of the predictions it made came true. Did you or Disney ever think it was risk to make a sequel so many years after the original? You had to appeal to both fans of TRON and younger viewers who perhaps hadn’t seen the original. I think that’s true, it was a big risk – here it is, the sequel, 28 years later! But it had a very good fanbase. And before they greenlit the movie, Disney showed some preliminary production designs at the Comic-Con convention in San Diego. It got such a great response they ended up greenlighting the movie, and as they went along they kept increasing the budget because the buzz on the movie kept increasing. And studios are always looking to build franchises that they can release around the world at the same time. Of course. And nowadays, you have a hit movie, you see a sequel two years later. Has the concept behind the sequel changed much over the years? Well, it’s been in the writing stages since 2002 and 2003, so it kept evolving with different writers. That’s pretty much always the case these days with franchise movies – the writing almost becomes a team effort, you know? The original TRON is famous for pushing the boundaries of visual effects. Was it more difficult to create something people hadn’t seen before in this era of big, CGI-heavy movies? Well, on the original we were in totally new territory. When we made it, there were only three places in America doing even rudimentary CGI – lots of the effects before that time, like in Star Wars, were model photography. We didn’t just use CGI on TRON though. We coloured each frame of the film, 24 frames a second, for the entire electronic world. We did all the inking and painting for that in Taiwan and had it shot back at the Disney studio. In today’s world, there are at least five 3-D CGI cartoons a year, and many movies use a tremendous amount of CGI. In that respect it was more difficult for us to push the boundaries. Do you think the films have a positive or negative attitude towards technology? I think it’s positive. The personal computer and the individual person triumphs over the mega computer in the first film, and in the second one the forces of good conquer the machine. I think they’re very similar, in terms of morality, in what they say about the future, and I think they’re both optimistic about technology. But they point out the dangers of technology when it’s in the wrong hands. Yes, that’s right. It makes it difficult for independent filmmakers to make movies right now though, because making a 3-D film costs something like $50 million. I mean, I made a lot of English co-productions a few years ago, and those days are kind of over, you know? Without government support it’s very difficult for independent filmmakers to get off the ground. As far as that’s concerned, [Disney] will probably wait and see what happens over the Christmas holidays to see if it holds up. It looks like it probably will; it doesn’t have that much competition in the genre, so it could very easily do good box office. I know it’s being digitally remastered, and I think that the remastered sound and picture will be far superior to the original. I don’t know when it’s coming, but I suspect the summer. [Laughs] I don’t know about that! But I did this movie called The Brave Little Toaster, and we’re looking to do that in 3-D animation. That’s one that we want to move forward on. Automan is an interesting idea. I forgot about that, it was so long ago!